This gives calculated values of Rmax, the radius at which the magnitude of wave function is greatest, for the valence p orbitals. 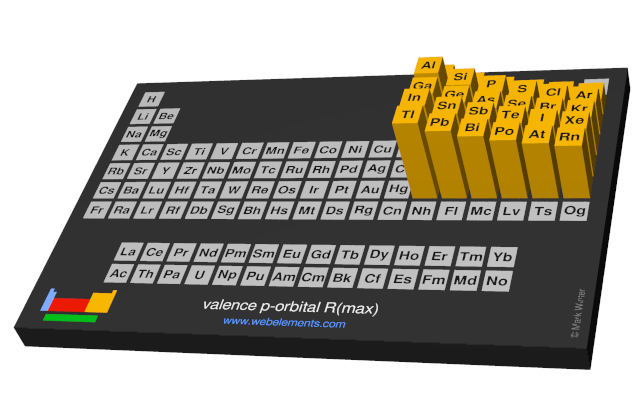 Image showing periodicity of the chemical elements for valence p-orbital R(max) in a periodic table cityscape style. 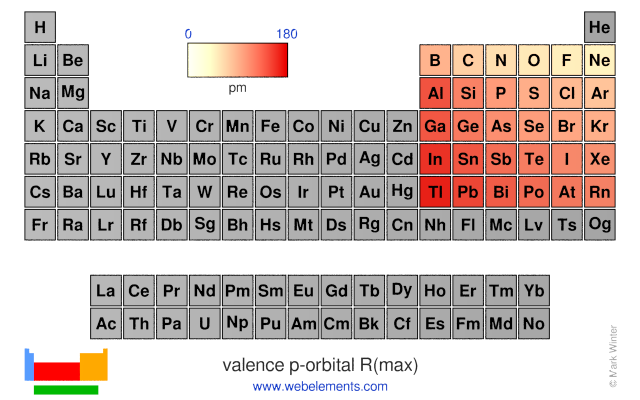 Image showing periodicity of the chemical elements for valence p-orbital R(max) in a periodic table heatscape style. 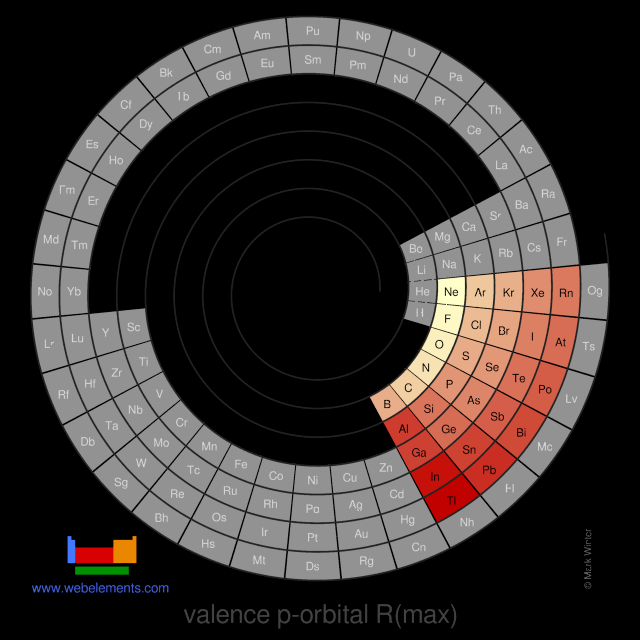 Image showing periodicity of the chemical elements for valence p-orbital R(max) in a spiral periodic table heatscape style. 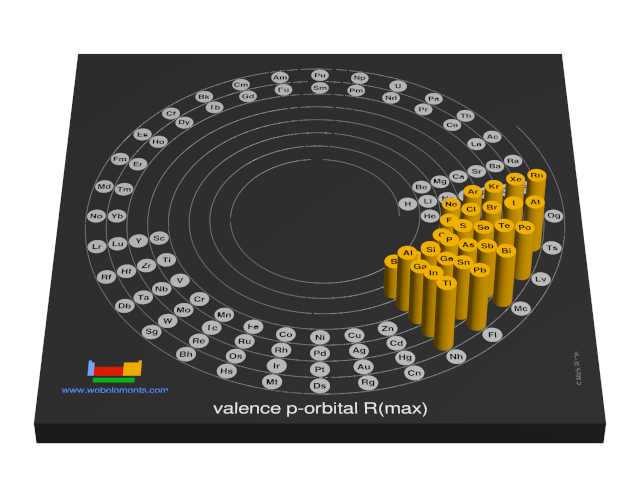 Image showing periodicity of the chemical elements for valence p-orbital R(max) in a 3D spiral periodic table column style. 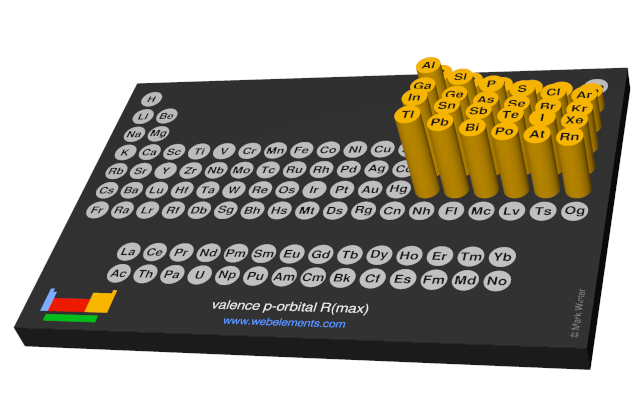 Image showing periodicity of the chemical elements for valence p-orbital R(max) in a 3D periodic table column style. Values given in the original literature are in atomic units (= 52.92 pm). Values given here in pm here are obtained by multiplying the original value 52.92. For access to various valence orbital R(max) data, select from the following (AU means atomic unit length units, pm mean picometres (10-12 m). J.B. Mann, Atomic Structure Calculations II. Hartree-Fock wave functions and radial expectation values: hydrogen to lawrencium, LA-3691, Los Alamos Scientific Laboratory, 1968.